The first snow of 2015 surprised us last Saturday. The day before, the weather services had predicted black ice and they even issued a weather alarm. But it wasn’t black ice we all woke up to, it was a coat of snow. The railways were taken by surprise and a lot of the train traffic came to a hold. Drivers also didn’t take enough care and many a car crashed. A bus driver crashed his bus almost into a home, but it came to a standstill against the roof’s gutter. But people kept on cycling. Cities around the country had tried to keep the roads clear of snow and ice. 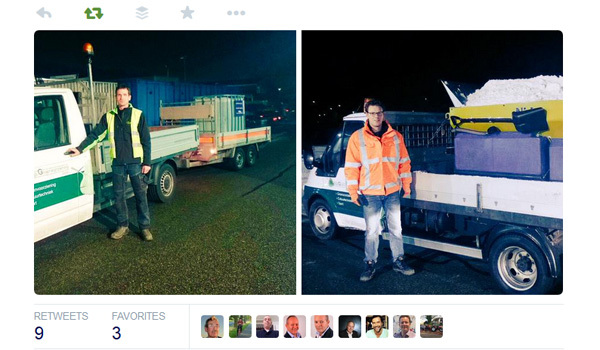 Late Friday night ʼs-Hertogenbosch announced on Twitter that the men were already on their way. The operators of the salt spreading vehicles went out in the middle of the night. They cleared the streets and the cycle routes very well again. That makes cycling in winter possible, it can never be as easy as in summer, but it comes close. 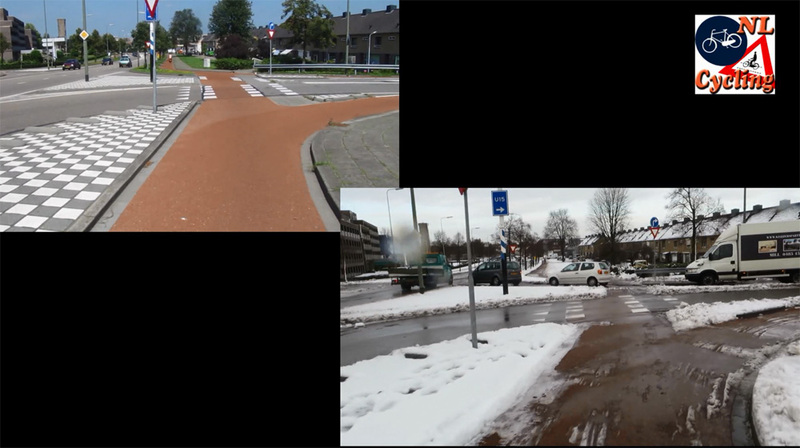 To see just how close, or in other words, to see how much difference there is between cycling in summer and winter, I prepared a video for you. 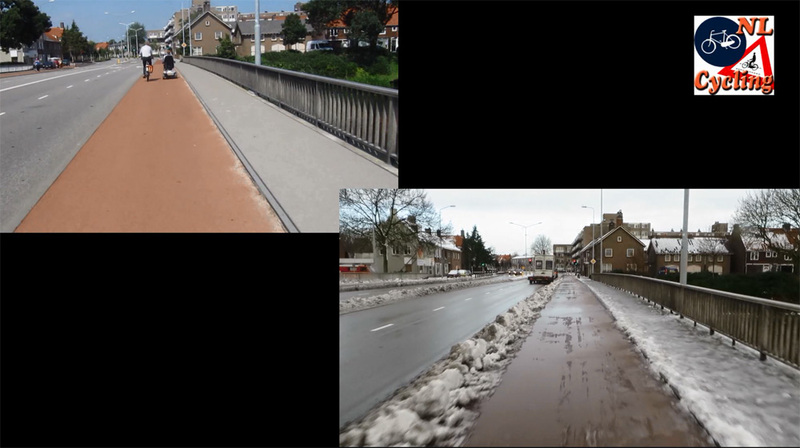 I cycled the exact same route twice, once in summer and once in winter conditions and I can now show you the images of both rides side by side. I chose this particular route because it has many types of cycling infrastructure in a short ride. In 4 minute 15 seconds you can see separated cycleways, on-street cycle lanes and a service street/cycle street. There are several types of junctions too. The video starts with a give way crossing, then there is a T-junction without traffic lights and one with signals. There is a roundabout and some smaller side-streets and it ends on a typical four-arm junction with protected cycleways all around it. 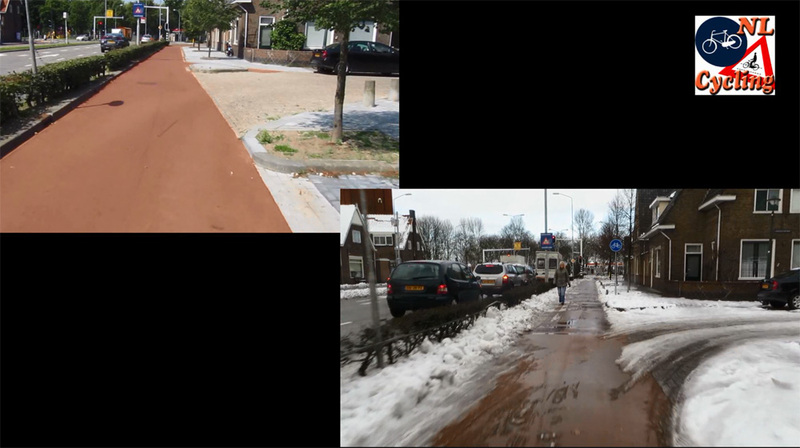 My video with a side by side comparison of summer and winter cycling conditions. The video has no sound. I have prepared some stills to point out some details that I think are worth mentioning. It is obvious that the summer and winter conditions are very different. 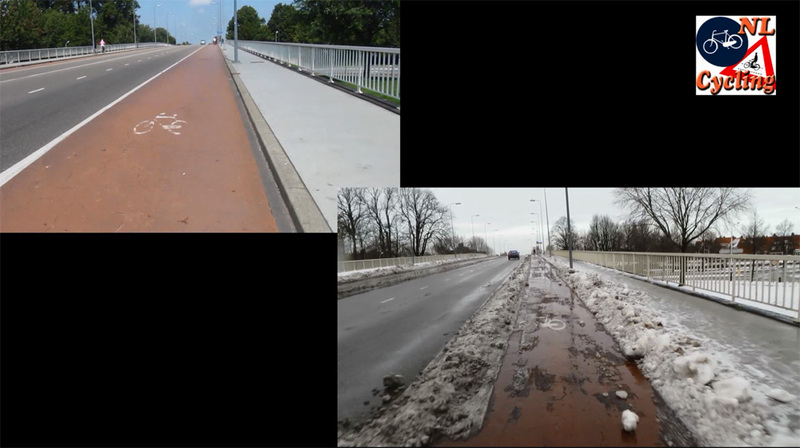 But both the roadway and the cycleway have been cleared well of snow and ice. 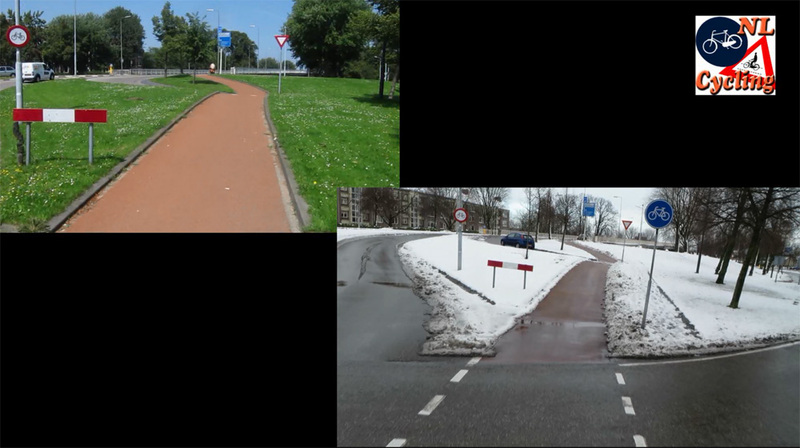 Also in winter the cycleway is in good condition to use it. There is no snow here from the roadway that was swept onto the cycleway. The entrance to it is perfectly clear. That is different on other locations. It depends on which vehicle cleared last. In this case the one on the cycleway. At this particular point you can see two cycleways that converge and which were both cleared. The last clearing vehicle obviously came from the right. That always leads to some residual snow, because the second vehicle always leaves some snow on the earlier cleared part, but it is not so much that you cannot cycle through it. This is an on-street cycle lane on a bridge. In summer it is very wide (275cm/9Ft, I tape measured it for a video once). But as you can see the full width is not completely cleared in winter. I don’t know how there can be so much snow left on the cycle lane at this particular point. Fortunately it is not so much that you cannot ride over or around it. At the end of the bridge the on-street cycle lane turns into a separated cycleway. The transition is no problem, because it was cleared by a vehicle that drove on the cycleway the same way someone cycling would. This T-Junction has no traffic lights. We cycle through the top of the T and that is the road with priority. This goes for motor traffic on the roadway, but also for cycling. The white van driver leaves a gap, so cyclists can pass and take their rightful priority. The van was stopped right where the crossing was cleared. It is not very wide, that cleared part, but it is enough to pass the junction safely. 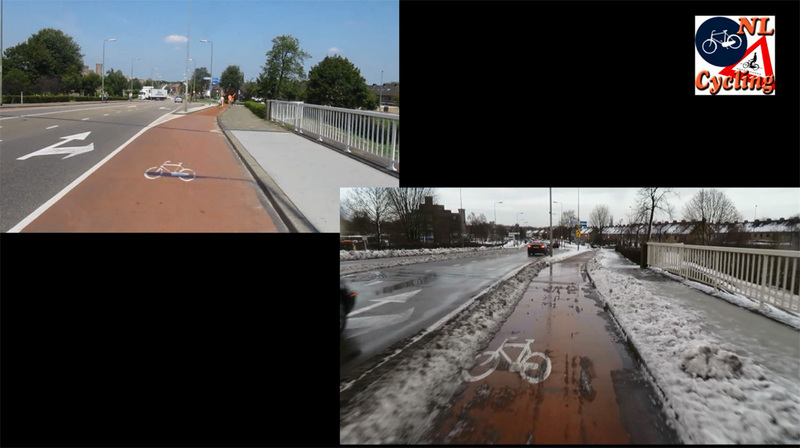 The separated cycleway was cleared well, much better than the earlier on-street cycle lane. Separated cycleways are always a better solution than on-street cycle lanes. Note that the side walk was not cleared. At such locations you should expect pedestrians to walk on the cleared cycleway. You can’t blame them. But because this cycleway is 2 metres wide, that poses no problems. It is not completely cleared, but there still is more than enough space to swerve around a pedestrian or a patch of snow that somehow was left behind. Being on your own part of the road, means you do not have to look behind you for motor traffic, before you swerve around an obstacle. The short-cut to the right, to a residential area and a 30km/h zone, has not been cleared. 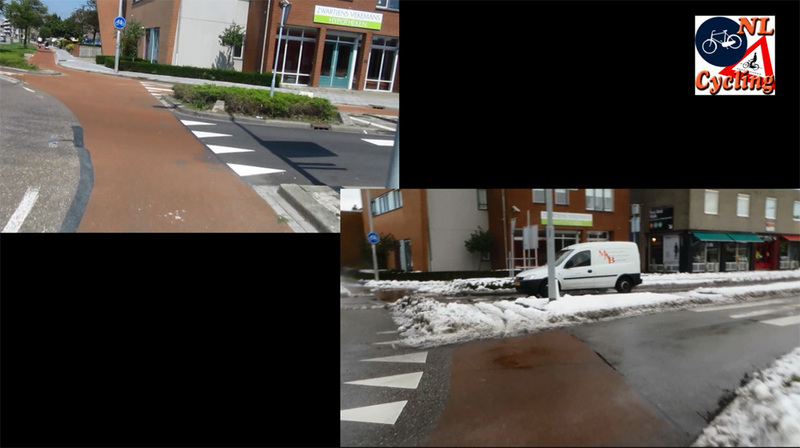 And the snow that was swept to the right really created a snow bank that you couldn’t cycle over. If you would want to use the short-cut you would have to dismount. But you can also go to the roundabout a bit further, to turn right there. At the roundabout you can see that the vehicle clearing the snow has turned right. It has then returned via the cycleway on the other side of the road. But that means that on the roundabout itself the snow was not cleared. It would have been nice if the clearing vehicle had made a full circle on the roundabout, before it turned here. That way the roundabout would have been cleared entirely. 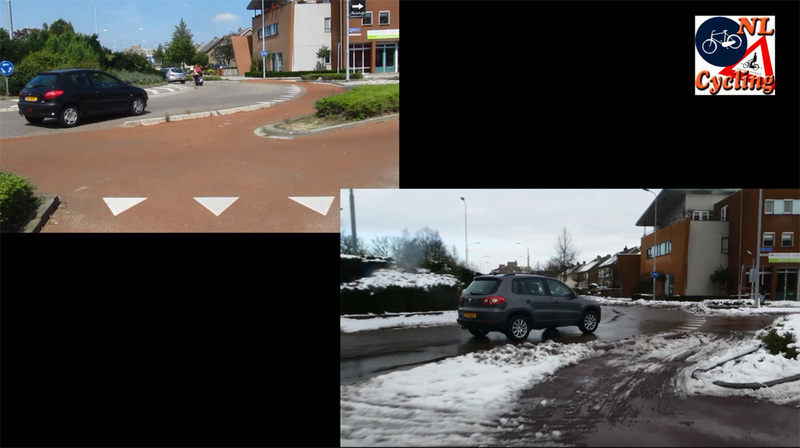 As I explained in the previous picture, the cycleway on the roundabout was not cleared entirely. 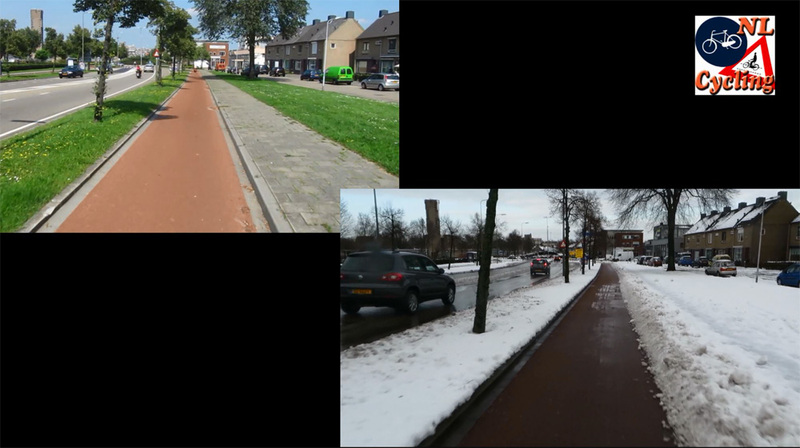 It was so bad here, that I chose to ride on the roadway around this patch of residual snow on the cycle lane. The residents of these homes are clearing their driveways of snow. That they shove it all on the cycleway is not particularly friendly. Maybe they were going to sweep it further and away again, but at this moment I was only just able to go around it. A second bridge. This time the cycleway is on a different level and there is a kerb (curb) between the roadway and the cycleway. With the snow in between that kerb becomes invisible. 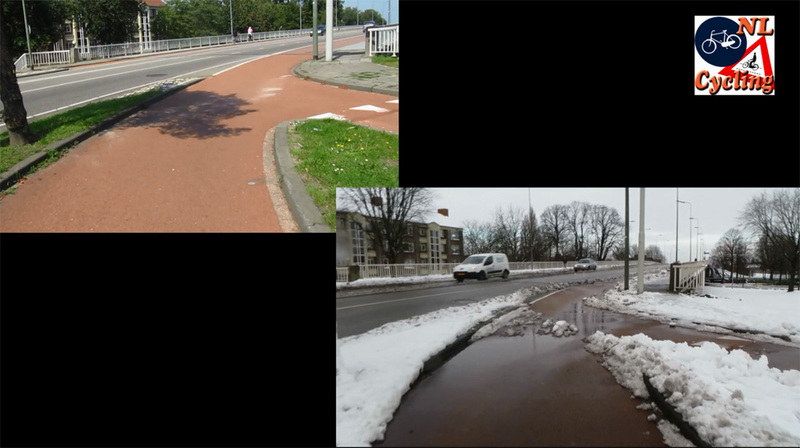 Dutch cyclists do not generally leave the cycleway, so accidents are unlikely, but it makes clear that a cycleway so close to the roadway may become slightly more dangerous in winter conditions. This is a smaller side-street with a traffic light controlled junction. Because it is smaller, there is no completely separate green phase for the different types of traffic. But the light for motor traffic does have an extra orange flashing arrow, to indicate that turning motor traffic should give way to people cycling straight on. It only flashes when the signal for motor traffic is green at the same time as the light for cycling is. Here we see the transition from separated cycleway to a service street/cycle street. 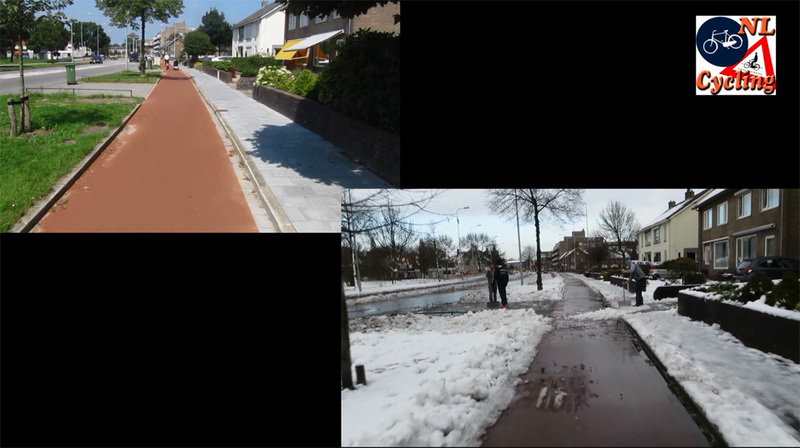 Easy to see that the 30km/h zone (to the right) is not cleared from snow and ice, it is cleared only where the route is also a main cycle route. This is the reverse situation of the previous picture. The service street/cycle street becomes a cycleway again. Motor traffic needs to turn right here. It is clear that the wheels of motor traffic spread out the salt, that melted the snow, a little bit into that side street. But the main cycle route goes straight on and that is also very clear. The pedestrian uses the cleared cycle way. No problem, there is more than enough space to pass her. This is a typical Dutch junction with cycleways all around it. Again we see that different vehicles leave traces of snow and that not all of the tracks have been cleared. But it was not impossible to just ride through this left-over snow. 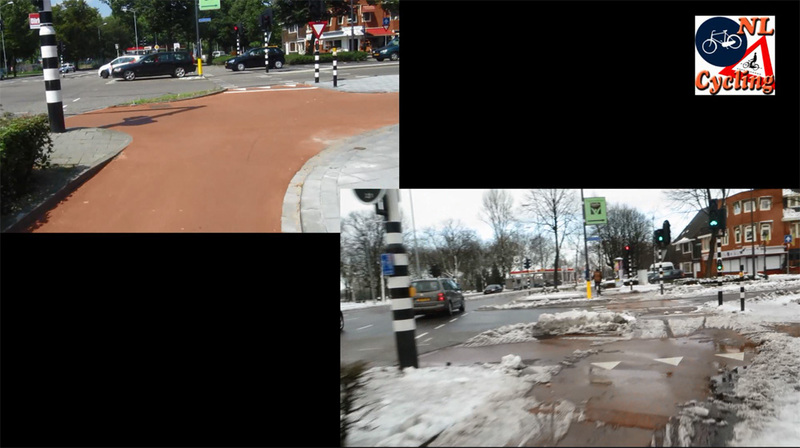 I will explain more about why winter cycling is no real issue in The Netherlands on the Winter Cycling Congress in Leeuwarden (NL), this February, with Herbert Tiemens of the Province of Utrecht. Very good article . I have been asked by Rospa in the UK to present to their national road safety committee about a paper I jointly wrote which recommended methods to increase winter cycling inc gritting cycle paths . My publication deadline for this presentation is 10 Jan. 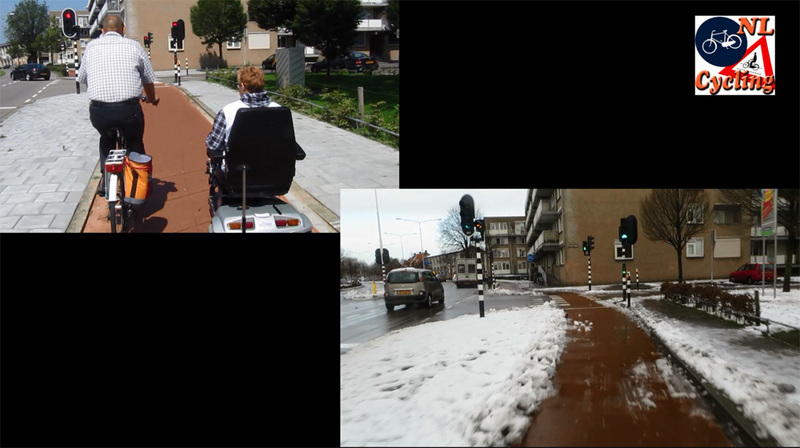 I am impressed with just how many path have been cleared for cycling, as shown in this post! Ice is the one hazard that I refuse to cycle on, and here in the UK, cyclepaths are not considered a priority at all when it is time to grit and clear roads. During such rare icy conditions, I am wondering if anyone in NL ever changes their tyres during winter months? Maybe even for metal studded tyres that grip so well on ice? Changing tyres for winter cycling is very unusual in The Netherlands. I don’t know anyone who does that. A bit more common is to let some air out of the tyres. If they are less firm they have more grip. People cycling with children in children’s seats on their bicycle are advised to lower their saddle, so they can stop and remain seated with both feet flat on the ground. That way it is easier to prevent a fall. But that’s about as far as we go for winter cycling. 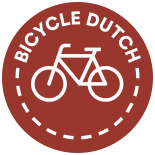 Dutch bicycles, with their closed chain guards, mud guards and skirt guards, and with their dynamo operated lights, are always ready for use, no matter what the weather conditions are. 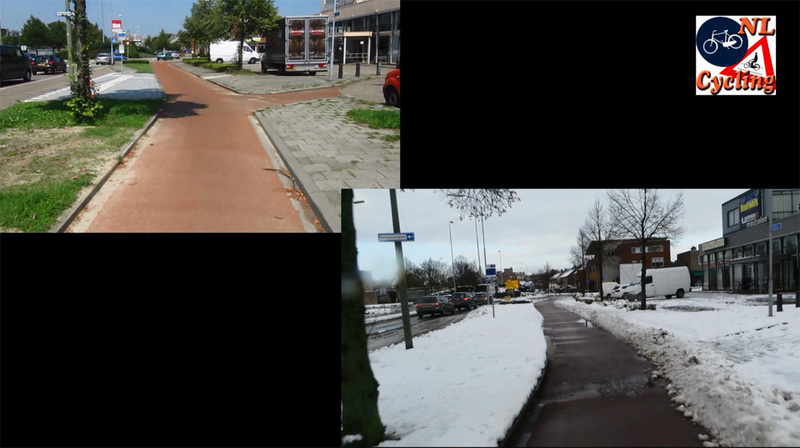 There are 18 main routes for clearing roads and paths of ice in ‘s-Hertogenbosch. Of those, 9 are mainly for cyclists and 8 mainly for car drivers and 1 mainly for pedestrians. At least, that’s what I remember having read somewhere, I can’t find it back now. On http://www.s-hertogenbosch.nl/inwoner/verkeer-en-vervoer/gladheid/fietsroutes-in-kaart/ there is a map of the cycle routes, on http://www.s-hertogenbosch.nl/inwoner/verkeer-en-vervoer/gladheid/autoroutes-in-kaart/ the car routes – but those are outdated, as the two villages that were added to the municipality January 1 this year have not been included yet. Does the cycle modal share fall much in the winter, or do people keep cycling all year round? It drops, but remains quite high. For a lot of people, the bicycle is the only option to get to work or school. They’ll cycle, no matter what. Others might prefer public transport when it’s raining or when very cold. A few will normally use the car, and take the bike only on nice summer days. From my experience here in Amsterdam, the model share of cyclists exceeds 50% in summer, and drops to something like 30% in wet or winter conditions. Thanks. 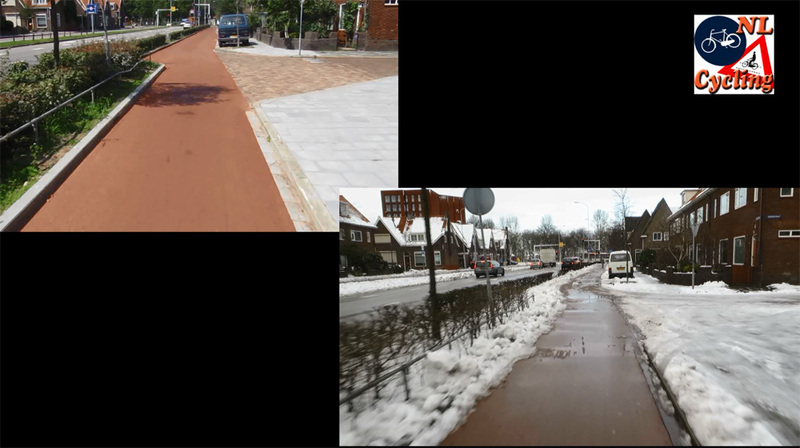 Weather dependency has been one of the traditional arguments in Sweden against cycling as an efficient part of a solution to the problem of transport. How does the rest of the transport system cope on days when cycling is lower than normal? Is car congestion notably worse, or buses and trams much more jammed? From my experience, public transport is more crowded when it’s raining. Car congestion is higher in really bad weather conditions, but I wouldn’t say that’s due to less cyclists, you’d expect the same number of cars to have more difficulties as well. Also, some people might adjust their schedule a bit, share a ride in a car instead of cycling, or choose to work from home or postpone their optional trip to some later day. In Norway, we use spikes on our deck. We have few cycle ways, and the cars drive close. When it’s heavy snowfall, it’s impossible to cycle. But we are a small and hard gang, who use our bikes year around. And remember Norway can be extremely cold. What made it so dangerous last Saturday was that the snow fell after a bit of rain had first fallen, well, here where I live anyway, So it turned to ice on the frozen ground, then the snow covered it, and then we had some more wet snow and rain. But perhaps in Den Bosch it was only snow? I don’t know really. I only went out when the streets were already cleared. Beware that I had to slow down and speed up the images here and there to be able to see the same location in both images throughout the video. So the car speeds you see could be different from their real speed! I’ve ridden in summer and I’ve ridden in winter. Summer’s better. 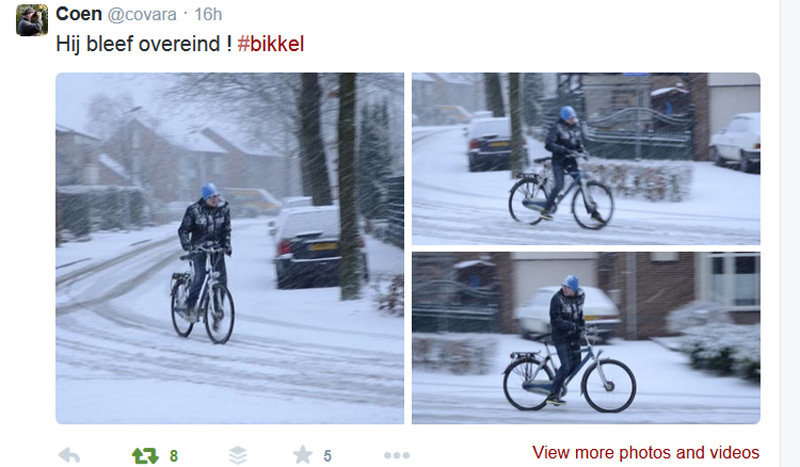 This entry was posted on 27 January 2015 by Bicycle Dutch in Original posts and tagged ’s-Hertogenbosch (Den Bosch), ride, Summer, Winter.